madly off in all directions: We're Away! Okay, our plane doesn't actually leave for another six hours, but this will be my last post for a bit. I found a great hank of yarn in my stash. 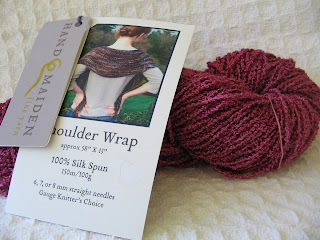 It's 100% spun silk in a metallic mauve boucle. The hank comes with a complimentary pattern for an easy garter stitch triangular shawl which I'm ditching in favour of a long rectangular open-work scarf. Should be easy-peasy and oh-so-satisfying on completion. Though Winnipeg and Toronto airports permit knitting needles, Dublin's doesn't, so I won't be taking this on the plane. I don't fancy a shake-down from Irish customs to start off Elly's stay in the country. It's an overnight flight anyway. I'm bringing Joseph Campbell's "The Hero With a Thousand Faces". Not the lightest read in the library, but I think I've lingered too long with Lemony Snicket these last few years. I'll try to post something from an internet cafe while I'm there, but can't give you any guarantees. We'll miss you at knitting! I hope your trip is wonderful, even though it's a working one. Come back with lots of stories.